Portrait of a Young Gentleman, a member of the Wade family. Pastel on paper, laid on to a stretcher. PROVENANCE: By descent through the Wade family, probably commissioned by The Rt. Hon. Field Marshall Sir George Wade (1673-1748). Rosalba Carriera began her career as a painter of miniatures for snuff boxes. She is thought to have been inspired to use pastels by the works of Benedetto Luti and requested pastels to be sent to her from Rome and from Paris. Rosalba, with well-deserved rapidity became exceptionally famous and influential for her exquisite use of the pastel medium and as her fame grew, prominent figures clamoured to sit for her. Her success only ended with an encroaching blindness which developed when she was in her sixties. Her earliest recorded pastel portrait is of Antonio Zanetti and dates from around 1700. In 1708 she was accepted into the Academy of St. Luke in Rome as a ‘pittrice e miniatrice veneziana’. In around 1710, Rosalba made the acquaintance of the connoisseur collectors Pierre Crozat and Pierre-Jean Mariette and in 1721 Rosalba was invited to Paris; her portrait of the painter Antoine Watteau is now well-known but she was then most celebrated for her series of pastels of French royalty and nobility which resulted in her election to the French Academy of Art. She also visited and worked in Modena, Parma and at the courts of Vienna and Poland. When she settled again in Venice her studio became immensely popular with foreign visitors to the city, and particularly with the English, to the extent that she described herself as being “attaqué par des Angles”. Her technique with its vaporous evocation of texture is at once naturalistic and highly stylised; her early training probably helped her minutely observed depictions of cloth and lace and the charm and limpidity of her likenesses became the essence of 18th century grace and civility. Recently rediscovered, this beautiful pastel has been in the Wade family since the 18th century. It can be presumed to be a portrait of one the natural sons of the Right Honourable Field Marshall Sir George Wade, an eminent and wealthy man who had a long and distinguished army career as well as being a generous benefactor. He was cultured and well connected in the London worlds of art and music. Field Marshall Wade commissioned Burlington to design his London house and is known to have owned a huge cartoon by Rubens of Meleager and Atlanta which was sold to Sir Robert Walpole and went to Houghton Hall. On his retirement, he was elected parliamentary representative for the city of Bath and on moving permanently to London he became governor of the Royal Academy of Music. Though unmarried, he had a number of children and in his will of 1747 he bequeathed the greatest part of his estate to two sons, at that time also active in the army: Captain John Wade (1720-1799) and his brother Captain George Wade (1721-1799); on his death they also became executors responsible for his properties and art collection1. 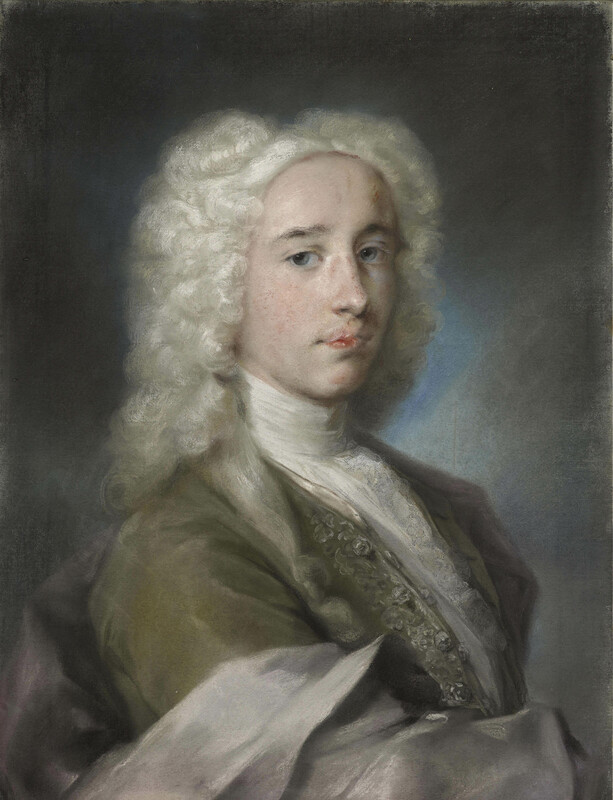 Given their proximity in age, this pastel could represent either one of these sons and given also the youthfulness of the sitter and the elegant dress it is most probable that the sitter had not yet started his military career. Field Marshall Wade’s interest in art and music may have led him to send his sons on a Grand Tour and this work is very much in keeping with the portraits commissioned from Rosalba with such enthusiasm by Englishmen in Venice, such as the portrait of Viscount Edward Coke at Holkham Hall2 and that of William Cavendish, Duke of Devonshire3. The most likely dating for the present work is the mid to late 1730s. 1. Information taken from Denise Chantry, George Wade 1673-1748, published digitally, Great Britain, 2012. 2. See Bernardina Sani, Rosalba Carriera, Turin 1988, cat. 328, fig.287. 3. See op. cit., cat.318, fig.278.